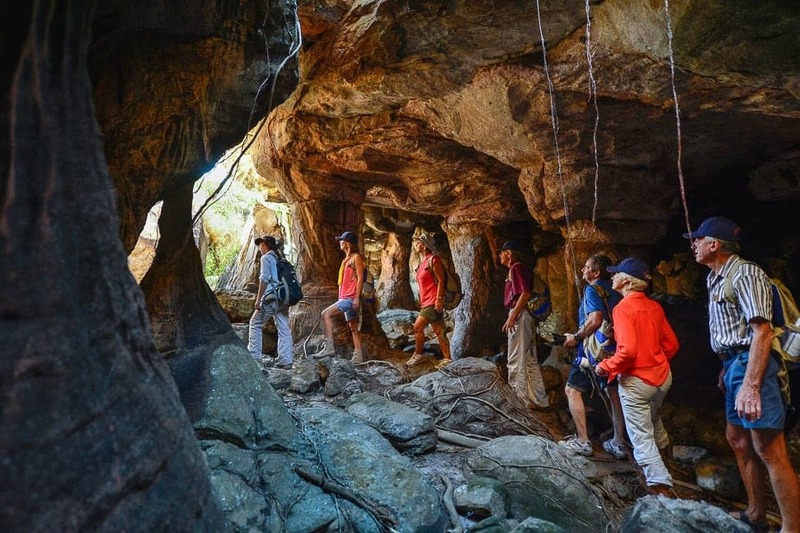 View extraordinary rock art galleries at Mount Borradaile, a registered sacred site nested against the Arnhem Land escarpment. Also visit ancient occupation sites including the ‘catacombs’. 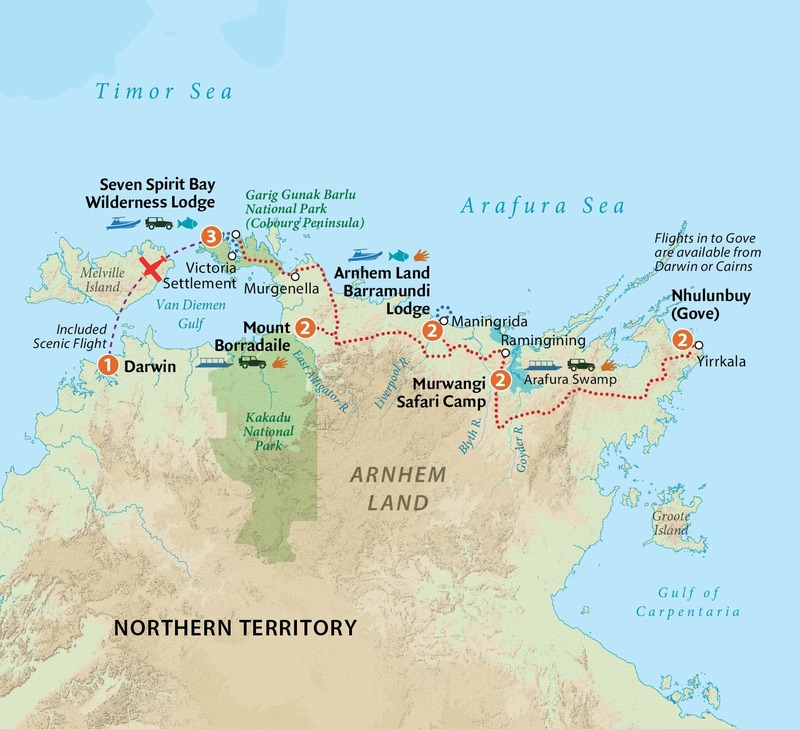 Arnhem Land is home to the world oldest surviving culture. Enjoy authentic cultural experiences with Indigenous guides who’ll share their knowledge and stories of this mystical land. Join our state-of-the-art vessels on an exclusive fishing expedition of the Liverpool & Tomkinson Rivers. Enjoy amazing scenery and learn from expert guides how to catch a Barra in one of the best fishing spots in the world. Take a fascinating journey back to 1838 on an historical tour of Victoria Settlement, Port Essington. Explore the old buildings while learning about the harsh living conditions experienced during early British occupation. 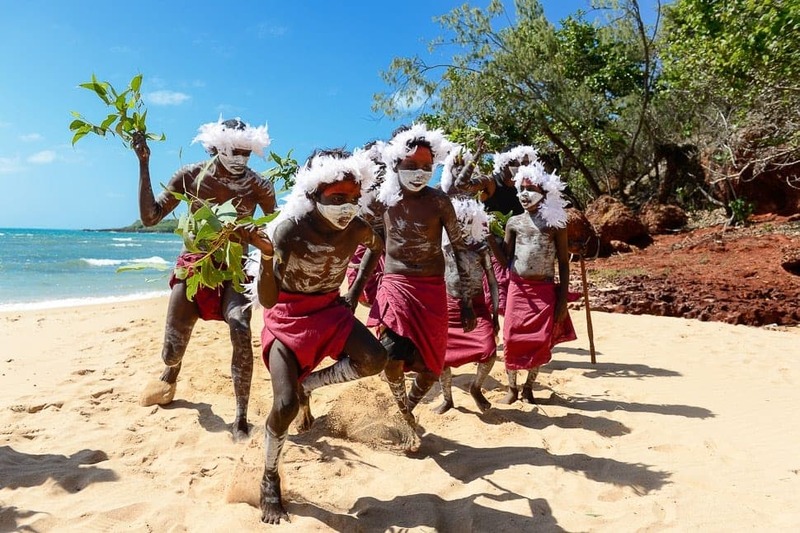 The Gove Peninsula has been home to Yolngu people for over 60,000 years and is one of the most culturally significant regions in Australia. You’ll get a true sense of this with a special ‘Welcome to Country’ ceremony at Wirrwawuy Beach, where we’ll learn about Yolngu culture and kinship first hand. We then visit the Buku-Larrnggay Mulka art centre, which boasts many renowned Aboriginal artists whose work can be found in galleries all over the world. Yirrkala is also where the Aboriginal Land Rights movement started, when the ‘bark petition’ was sent to federal parliament in 1963. From the art centre it’s a short stroll to Shady Beach for lunch and a special Bush Medicine and Women’s Healing demonstration. Experience traditional healing ways and hear stories of how Yolngu live and heal on their land. The Arafura Swamp is one of the largest wooded swamps in Australia and covers approximately 1,300 square kilometres. This incredibly diverse wetland can support up to 300,000 water birds at any one time, including Magpie Geese, Egrets, Black-necked Stork and Brolgas. The swamp is of great cultural significance to Yolngu People & was also the location for the 2006 film ‘Ten Canoes’. 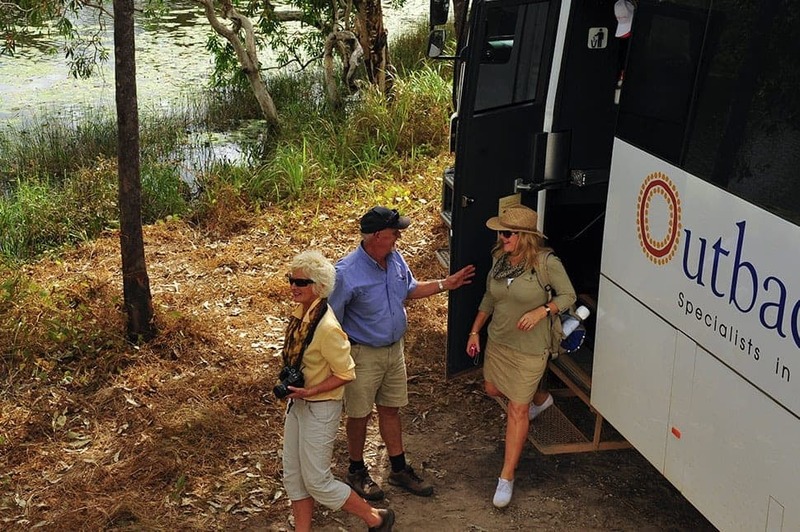 Today enjoy a tranquil cruise on the main lagoon, followed by a 4WD adventure around the edge of the swamp. For both activities, we’ll be accompanied by Indigenous guides who’ll explain why this spectacular area is so significant to them. This morning we farewell Murwangi and visit the Bula’bula Art Centre in Ramingining. Chat to local artists as they paint right in front of you. (Artwork can be purchased if desired). After morning tea, we head further west towards Maningrida, crossing the Blyth and Cadell rivers before arriving at the Arnhem Land Barramundi Lodge. 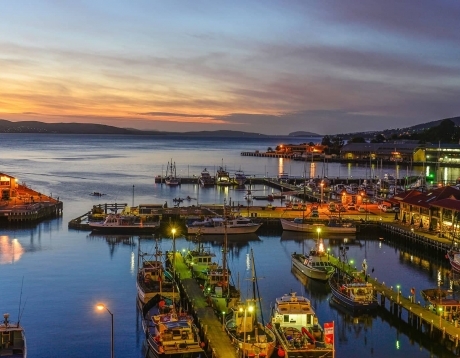 Recognised as one of Australia’s premier fishing destinations, the lodge holds exclusive fishing licences for various waterways and coastal areas, including the Liverpool River. After a full redevelopment, the lodge now features 12 beautiful safari suites and a restaurant overlooking the Tomkinson River floodplains. This morning we enjoy an exclusive fishing adventure on the Liverpool and Tomkinson Rivers, pristine waterways teeming with barramundi. Our expert fishing guides will take you to where the fish are biting aboard our sturdy Ocean Master vessels, the pinnacle for remote marine adventures featuring an onboard restroom and shade canopy. Today’s fishing adventure is also a wilderness tour, so even if fishing isn’t your thing you’ll still enjoy the amazing scenery and commentary. If you do land a ‘Barra’, be sure to take it back to the chef who’ll prepare your catch for dinner! Departing Maningrida after breakfast, our travels take us through the stone country of west Arnhem Land. 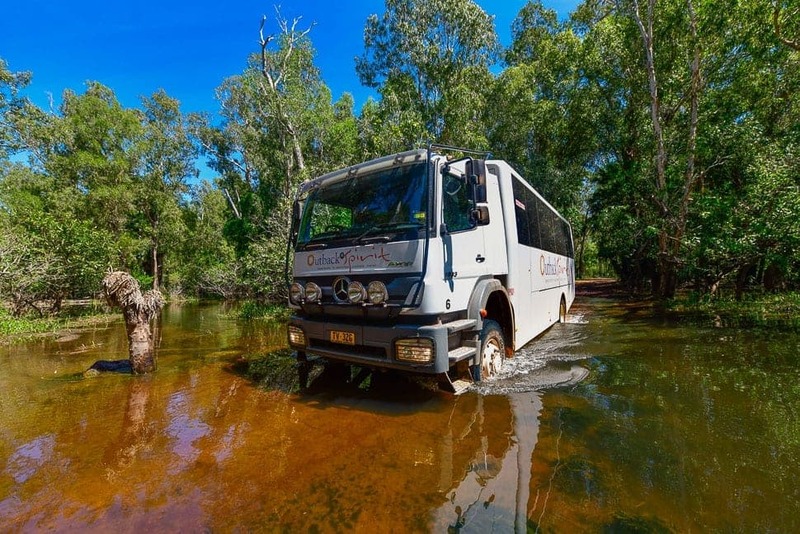 Cross the Liverpool and Goomadeer Rivers before arriving at the turnoff to Davidson’s Arnhem Land Safaris, Mount Borradaile. From here we travel along a 40km bush track into the safari lodge, arriving in time for lunch. We’ll then check in to our cabins, our home for the next two nights. Today we jump into the open-back Toyota’s and continue exploring the wonderland that is Mount Borradaile. 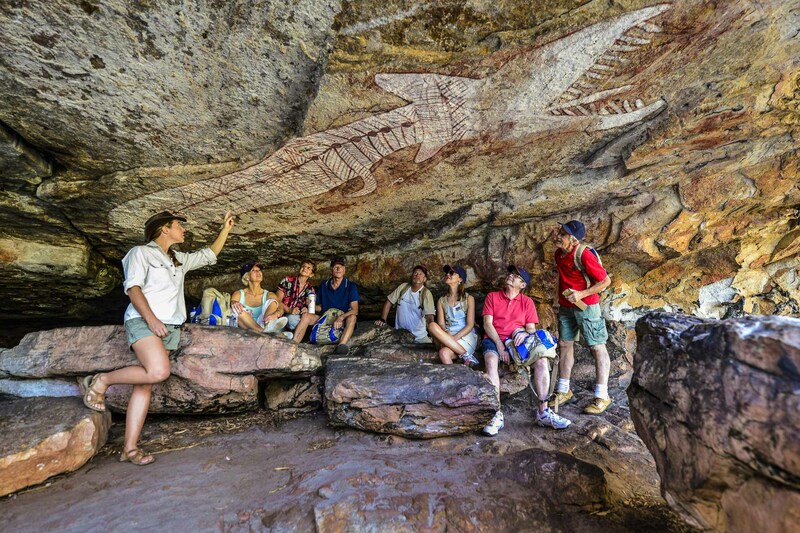 Visit the ancient ‘catacombs’, where the sandstone has been eroded by wind and water over 600 million years resulting in a massive cave system that is full of incredible Aboriginal Art. Learn about the variety of techniques used in rock paintings as the styles changed over thousands of years of occupation and storytelling. We’ll also view ancient occupation sites and a range of artefacts from when these areas were lived in. Today we enjoy a marine adventure down Port Essington aboard the lodge’s specially designed vessel ‘MV Arafura’. Designed by NAIAD in New Zealand and built in Australia, these amazing vessels are the ultimate marine sightseeing craft. Departing Seven Spirit Bay, we retrace the course of the early mariner’s square riggers, passing landmarks like Gunners Quoin, Low Point, Turtle Rock, and Observation Cliff on our way to historic Victoria Settlement. Surveyed in 1838, Victoria Settlement was the third attempt by the British at a northern settlement after Fort Dundas on Melville Island, and Fort Wellington at Raffles Bay. Conceived to facilitate trade with Asia, the settlement consisted of 24 houses and a hospital. Disease was rampant and living conditions poor, leading to its abandonment in 1849. Upon our arrival at Victoria Settlement we’ll take an informative and fascinating tour of the old buildings and ruins, learning about life in the early British occupation. There’s an optional extension to the walk which leads to lonely gravestones in the forest, almost forgotten by history. The Cobourg Marine Park is teaming with barramundi, spanish mackerel, golden trevally and coral trout to name just a few. After breakfast, we board the lodge’s state-of-the-art fishing vessels for an exclusive half-day fishing adventure to Trepang Bay. Featuring an onboard restroom, shade canopy and comfortable seating, each boat takes only 6 people so everyone will have the chance to reel something in! Seven Spirit Bay’s fishing guides are true professionals with intimate knowledge of the marine park. They’ll take you to the best fishing spots and share their knowledge of this stunning marine sanctuary en route to Trepang Bay. Once we enter the mouth of Trepang Creek, it’s time to land a Barramundi! Your guide will pick out the best spots to land this iconic Australian fish as we slowly meander up stream. The creek narrows and vegetation closes in as we approach our private landing. We then disembark and rendezvous with the lodge’s sous chef for a delicious BBQ bush lunch. If anyone’s caught a Barra, it won’t be long before it’s on our plates! 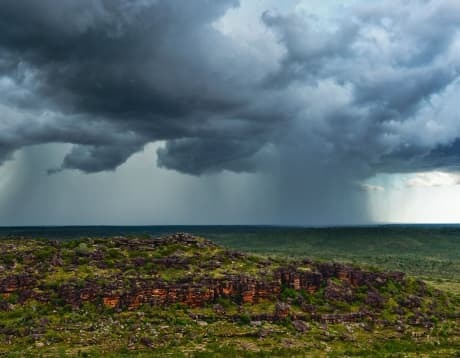 Arnhem Land is Aboriginal Land, and being able to see it is a real privilege. 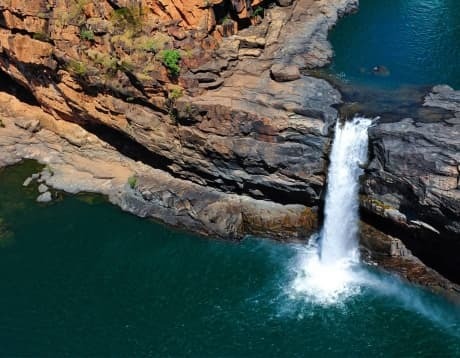 Through consultation with Traditional Owners and the Northern Land Council, Outback Spirit has developed an adventure that is truly unique. No other tour operator can take you through this sacred land. 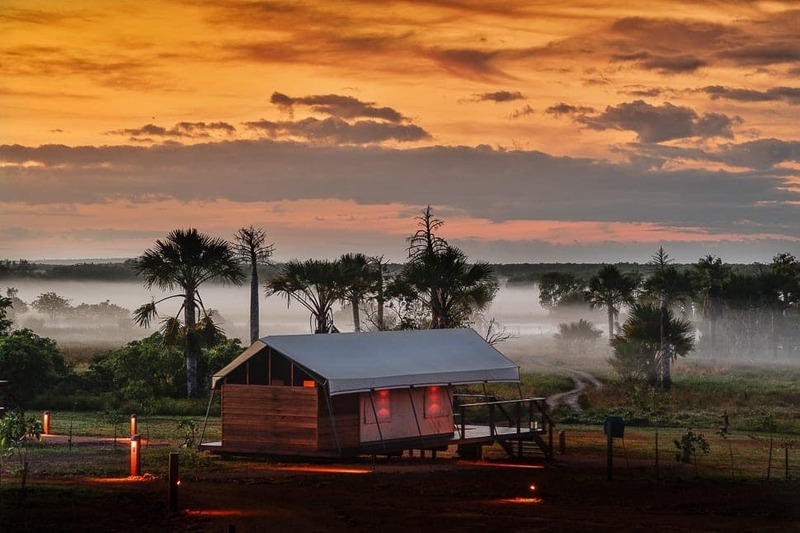 To enable this incredible adventure, Outback Spirit has invested over $15 million into three unique safari camps and lodges. Situated in stunning locations, each one offers all the comforts of a 5-star hotel along with friendly service and exceptional cuisine. Enjoy an intimate and enriching touring experience with just 21 other like-minded people. Form lasting new friendships, avoid the queues and stay in unique accommodation venues off-limits to larger groups.